Plateau Perspectives has partnered with a variety of academic institutes and research centres over the years, especially in Qinghai Province and Tibet Autonomous Region, China. 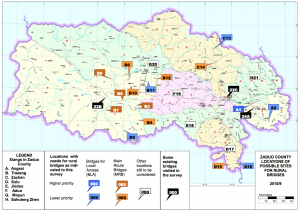 Areas of collaboration have included natural resource management, wildlife monitoring and research, social development, and applied civil engineering to enhance access in remote mountain regions of the Tibetan plateau. Plateau Perspectives partnered with Qinghai Normal University for many years. From the joint organization and co-hosting of international academic exchanges and workshops to running a special seminar series, introducing and facilitating international research collaborations, and placing selected language and research students at the university, Plateau Perspectives continuously has sought to promote further development of post-graduate education in Qinghai province. Specialist workshops included dialogue on pastoralism, grassland management, tourism development and community cooperatives – all in collaboration with the University’s School of Geography & Life Sciences. Special seminars have been given by Dr John Hodges on How globalization affects livestock-keepers and their animals (November 2010), Dr Peter Foggin on The Canadian experience of settlement and relocation in the Far North (May 2011), and Dr Robert Pelant on The Roles of Animals in Sustainable Development: Opportunities, Strategies, and Challenges (June 2011). Plateau Perspectives also was instrumental in introducing and facilitating provincial approval for the NSF-funded research project Determinants of Grassland Dynamics in Tibetan Highlands in Qinghai Province. From 2009 to 2013, Plateau Perspectives associate John Friberg taught civil engineering, participated in departmental seminars and carried out applied research at Qinghai University. 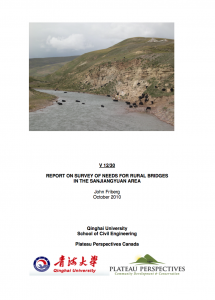 His research focused on the design and trialling of suspension trail bridges to increase access in remote regions of the Tibetan plateau. His work was based on models developed in the Nepali context. At the Agriculture College of Tibet University, Plateau Perspectives director Marc Foggin presented a 2-week special lecture series in December 2011, on conservation and protected area management – with a focus on lessons learned from Qinghai Province, China, and from Canada. This high level exchange visit was part of a national Chinese project on conservation and collaborative management that sought to promote international exchange and cooperation in Tibet Autonomous Region. 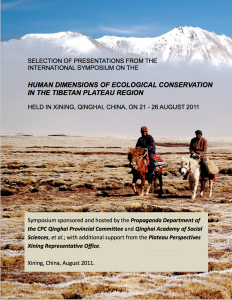 An international symposium on the Human Dimensions of Ecological Conservation in the Tibetan Plateau region was held in Xining on 21-26 August 2011. The meeting was sponsored and hosted by the Propaganda Department (Public Relations) of the CPC Qinghai Provincial Committee and by the Qinghai Academy of Social Sciences, with additional support from Plateau Perspectives’ Xining Representative Office. Professor Li Laixing is an ornithologist who has been researching potential pathways for avian flu transmission through a study of the distribution of bird colonies (nesting sites) and migratory patterns, centred on Qinghai Lake and other wetland areas of the Tibetan Plateau. In 2007, Plateau Perspectives staff joined him for field investigations in Hainan and Guoluo prefectures, including the upper reaches of the Yellow River.